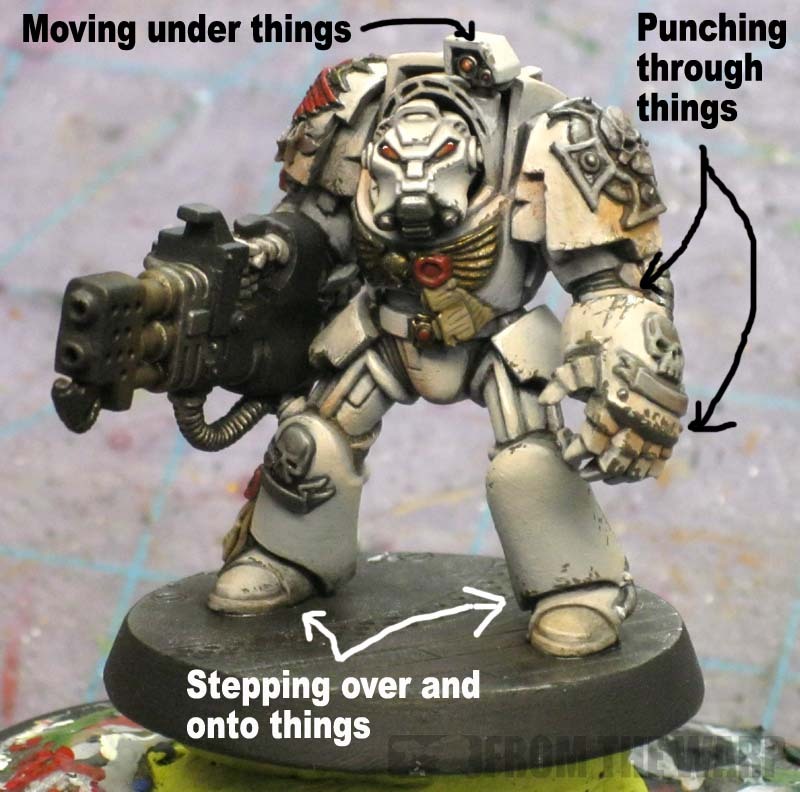 We always talk about HOW to apply battle damage, but I don't think I've seen anyone talk about WHERE we should apply it to our models. This post is going to look at some of the places I place my damage on my models and the thinking behind it. The whole idea came up in a discussion I was having with Feldmarshal Goehring over at Pitched Battle a while ago. Through a series of emails, we got on the subject of why you apply your battle damage in the places you do. Here's what he had to say about his tanks. "I just thought about the heavy frame of a tank driving around the battlefield, rough terrain, ruins, etc. In my mind, the places which are most likely to make contact and lose paint are edges and corners. I gave more attention to the lower portions of the tank. All around the treads. Up the sides just a bit on the smoke-stack frames which stick out of the side of a rhino chasis seemed like a place where a bit of damage should go. They stick out the side forming the widest portion. If you drive through a ruined building, then the edges of those smoke-stacks would receive scrapes. I tried to make them look like they were received with the vehicle in motion: heaviest toward the front and tapering off. I decided there would be some in the front (bumper area of a car) scraping towards the under carriage. Beyond that, I put some damage on the higher front and top, including turret, where I thought the tank might receive enemy fire. Also, I put some damage around things that would be opened and closed often by the crew (hatches and the like). They would experience some wear and tear from regularly being opened and closed to access spaces. I didn't put any damage on the components of the weapons themselves. I put some damage on the casings of the sponsons, but not weapons. I am a Chaplain in the US Navy, and we serve as Chaplains to the Marines. My experience in both branches has been that weapon systems are maintained at the highest standards. A Marine never lets his rifle descend into disrepair. It must function properly the first time, every time in order to terminate threats in an engagement. A Gunners Mate maintains his weapons at the highest standard, because with it he will repel boarders and defend the ship. I figured Space Marines would also pay particular attention to maintaining their weapon systems. I tried to keep in mind the overall aesthetic of the tank as a whole as well. I didn't want to lay it on too thick. I had an idea of how much damage I wanted before I started applying it, and I tried to keep that idea or goal in mind as a guide." Well said Sir, well said. In this case, he's got some personal experience to go from. That can go a long way towards helping you decide where to apply damage and where to leave it off. What do I do with my own models? I do something very similar. Similar in that I have a plan as well. Not having the same background, I opt for more of a "looks good to me" approach than accuracy sometimes. I have a tendency to apply my damage in places it can be seen so that a little bit goes a long way. I do stick to places I can convince myself it would be located though. I just don't throw it down on every free edge. I try and keep in mind things like how equipment is used and what edges are going to be handled the most. If anything is going to show some wear and tear, it's going to be things like chainfists, chainswords and other things that strike against objects. 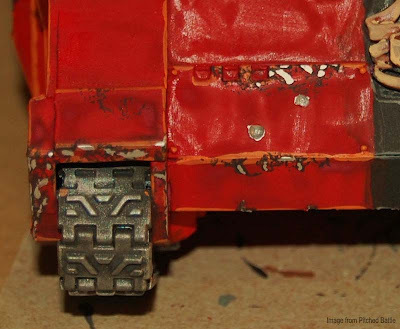 I try and add some wear and tear to armoured boots and the outer edges of armour plates that would rub against bulkheads and buildings as a marine moves through terrain. Anyplace where things (armour and the environment) may collide. I don't apply it in every place it would be on a real set of armour as that might be too much. I have a tendency to go heavy on my application as it is and I have to be very careful not to overdo it. For me, it's about getting a feeling to the model more than it is about getting it accurate. If it feels right, then that's the gauge I use. The most important thing of all! The most important thing of all is to know when to stop. When you come to the point where you look at your model and say to yourself, "I just need a little bit more battle damage," you need to stop and not add it. And it's not just damage we're talking about. Little additions like rust, dirt and grime can add tons of character to a model. The trick is finding just the right balance of each aspect and then not overdoing it. In some ways, it goes back to painting just what you need to. You're not trying to duplicate the effect exactly as it would be in real life, you're just trying to suggest enough of it so the viewer walks away thinking the model has seen tons of combat. While it might not seem that important, it does help to consider how your battle damage ended up where it did on your model. Putting it in one place can be as effective as leaving it off of another area. It's not just as simple as put it down on every edge you can get your brush on before you run out of paint. If you take a minute and think about what could actually be damaged, you might end up contributing to the story you're trying to tell instead of detracting from it. If you think about, we go to great lengths to tell a story with our basing. From choosing certain colors to whether or not we add static grass and what color it should be. We add decals and freehand to help our model fit into the chapter they are part of. Why not make the battle damage they've suffered look like it came from real use as well? I've always wondered what is too much or too little, but sometimes you only need the appearance of damage on some parts to make it feel worn. Really, I like his and your points. Look as where it will be moving against stuff and put it there. Thanks for a great article, I'm always worried about ruining a good, by my standards, paint job with hamfisted weathering and damage, so any advice is welcome. I don't know of this has been done or even can be done, but would it be possible in your opinion to weather and battle scar your army dynamically. Ie start clean then, after a few games, start weathering them. If they get badly mauled one game add a little battle damage and so on.... you could spot you're older units and new ones would eventually blend in but they would look like the reinforcments they are to begin with. The paint job would be almost biographical. Fayte: That's it exactly, the appearance of damage... not necessarily duplicating it. rob82: That's a cool idea. I did something similar to the Deathwing squad I painted a while ago. They all had damage and such except for one suit of armour. he stood out from the rest as the "new" guy. EllisW: Glad it helps! I just weathered a perfectly good Brazen Claw terminator last night. Took him from looking like he was right off the assembly line to battle torn. 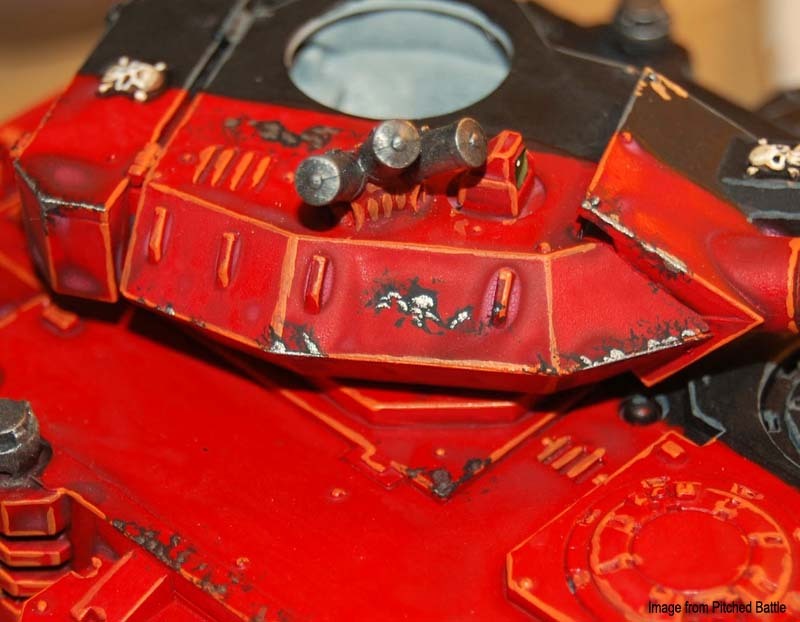 For me there are 2 major principles when it comes to weathering and battle damage. The almighty rule of cool: if you like it dirty then make it dirty. Actually this is a part of a more general rule I keep repeating whenever in doubt "You are doing it for yourself". Its a hobby, you have to enjoy yourself at all times, and if you like how your mini looks then it looks right, no matter what "should" or "should not" be there in real life or some1's imagination. Well and the second principle is to think about what happened before that moment of time your mini represents. Like there was rain yesterday that created now dry dust, and just a moment ago a shell hit the wall next to this guy, covering him with concrete dust... so both the mini itself and its base look after weathering and b.damage have to fit into that story. I actually post some weathering inspiration photos recently -- including some photos of tanks on active deployment. I myself view each Space Marine in my chapter as a weapon system, and as such none have damage that isn't new looking. No rust, nothing that doesn't look fresh. The armour that they wear, and drive, is centuries old, and can't make it that long if it is left in disrepair between engagements. You have produced another great article and help for our hobby experience, Ron. Thanks for letting me participate. Psish: I like the rule of cool. That's perhaps the best way of all to say it. Justin: Very cool pics. I didn't realize just how dirty a "clean" tank was. Throne Bearer: Good point. I like to think of more like an accumulation of junk as opposed to disrepair. In combat, or in their case, stopping to clean your armour while engaged in derelict space hulk cleansing might not happen for a few weeks. Feldmarshal: Thanks for allowing to share our conversation with everyone else! Dunk: Glad you like it. Hopefully this article gets folks thinking about the damage they apply and not just throwing it on there willy nilly. Great aricle and definitely helped when I just tried painting battle damage for the first time on my new Space Wolves. It really is about getting the impression of damage and not going too overboard. I attempted to damage the finger tips but it was too small and muddled the effect in the end. Even though it's "realistic" it also has to look good! Matt: That's it exactly... the impression of damage. You don't have to be exact, the trick is giving the viewer the impression that the item is battle damaged. I like the post on Battle damage, I have been pondering about the best way to apply battle damage of Shots fired at armour, that actually pierces or glances off cutting a groove in the armour. Murray Boyton: Adding actual physical damage to a model is the next step. Just like other methods, adding it becomes a balance. Like you said, too much and it looks out of place. Now how to do it... I think GW had an article on it once. I might see if I can dig it up.